Have you ever really wondered who you are and why you are here in this body, at this time? Deep inside the memory of your cells, and within the door of your heart, your answers to who you are can be found, but how do you get there? How do you unlock lifetimes of memories and wisdom? How can you find your Truth? One night last week I entered the realm of dreams while visions of ancient Egypt played with the gods inside the garden of my mind.There was Horus with his maddening blue eye, Isis mixing magic, Ma’at with her feather of Truth, and Sekhmet, the warrior goddess holding the ankh and her secrets to heal. I had recently finished reading Sue Vincent’s The Osiriad, and had just begun Denise Linn’s Past Lives, Present Miracles. In a shadowed corner inside my mind, amid the play of gods, I searched for myself and saw a woman bent towards the ground, drawing a story in pictures. Stand up, I begged her, Show me who you are. Tell me your secrets. The last image I can recall before I succumbed to sleep, was of an ancient oak tree. I was traveling down its trunk into the heart of Earth. I can’t tell you were I went, only that I met a parrotfish. One, stubborn image that stayed inside my brain after waking. There was a part of me that found it rather funny and, well, random that I had dreamed of a parrotfish. It seemed completely nonsensical and unrelated to my night musings. I had, after all, never before given the parrotfish much thought. I only vaguely knew what it was. But, I’m not much of a believer in random signs, especially a sign that had stuck so stubbornly inside my mind. It was, of course, a messenger from Spirit. I just needed to figure out what it was trying to tell me. So, I opened the computer, and did some research, while Sue (yes, Vincent), quietly nudged me along across the ocean. While I silently thanked God for my friend who doesn’t appear to think I’m crazy, and happens to possess a wealth of esoteric knowledge, I decided to explore the messages of my colorful messenger. While Sue wrote about polarity and the “surrender of self,” I thought about a fish that has the ability to change gender, color and size. The parrotfish is, you could say, a shapeshifter, having the ability to adapt and transform to its changing environment. It is, in essence, neither wholly male nor female, but able to harness the universal yin/yang, masculine/feminine energies we all have within us, at will. The parrot fish also wears the colors of the rainbow, the pattern and hues displayed subject to change throughout its lifetime, like a chameleon of the sea. 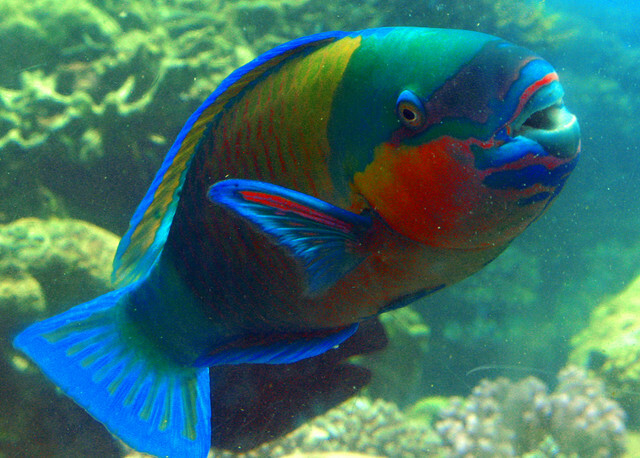 The parrotfish, although residing in the warm waters of the tropics, is also connected to the element of air and land. Named after the parrot for its colorful scales that resemble the tropical bird for which it is named, the parrotfish also sports a mouthful of impressive teeth that are shaped like a beak, as well as a second set inside its throat. The more I read about this remarkable fish, the more my head swirled with symbolism. Here I was trying to evoke the memories of a distant past life I had led in ancient Egypt as a woman scribe, and it seems Spirit had scent me the parrotfish. It was a lot to digest. Later in the morning, a dam inside of me broke and the waters of my emotions spilled from my eyes. 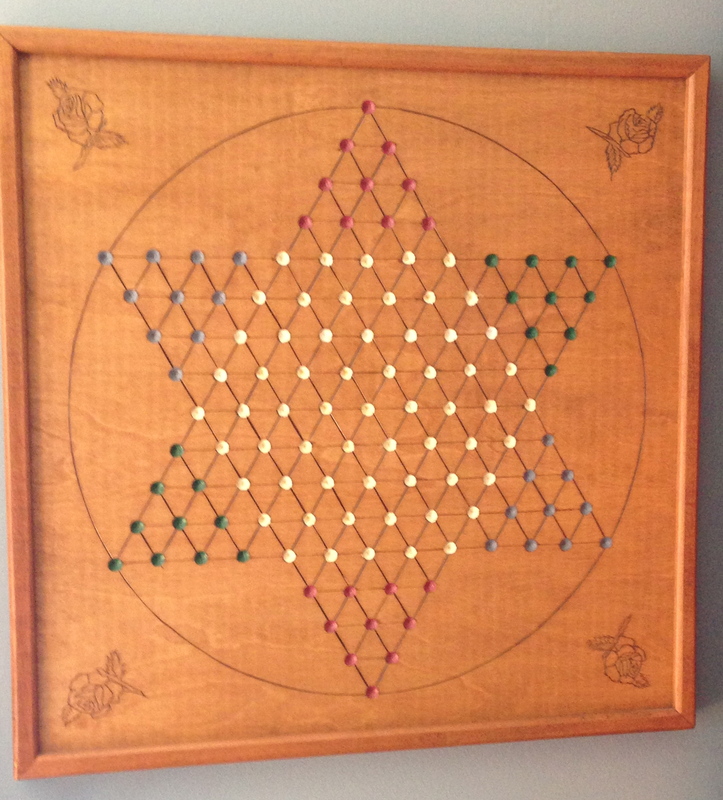 I sat in my blue living room and looked up on my wall, noticing for the first time that the Chinese checker board my late grandfather had carved into wood was actually two interlocking triangles, the hexagram, a symbol that Sue explores in-depth with her coauthor Dr. G. Michael Vasey in their book The Mystical Hexagram. As I gazed upon this beautiful representation of united polarity, this union of opposites, I felt a peace settle over me. I knew in that middle space, I would find my Truth. Or, to put it another way, the Truth was already there, unfolding like the roses etched into the corners of the square. If you happen to encounter the parrotfish as a messenger, consider asking yourself these questions: Is there something you are hiding within that seeks to be found? Are the energies within you in need of balance, or are you being called to express more of your inner yin or yang? Are you comfortable speaking (and digesting) your Truth, or is a fear holding you back? Are you expressing your true, colorful self and your innate talents? Is there an alchemist inside of you waiting to be born? The parrotfish calls us to balance the energies within us. To connect the elements of air and water and bring forth our creative gifts into this reality. It calls us to fully and fearlessly express our true selves. This beautiful being reminds us that we are more that what we appear to be on the surface, and that our true mysteries lie within, waiting to be expressed. This entry was posted in Animal Messengers, Dreams, Memoir, Reflections, Uncategorized and tagged ancient Egypt, denise linn, G. Michael Vasey, parrotfish, parrotfish symbolism, past-lives, Present Miracles, Sue Vincent, The Mystical Hexagram, The Osiriad. Bookmark the permalink. A rainbow ankh – beautiful! Rainbows have always been special to me, but also seeing them more in prayer and meditation too. Feel free to email me so we can talk more! It is nice to know I’m not the only one who dreams apparently random things… and finds personal significance in the oddest symbolism. Nice too to know that your books have held meaning for a reader. Pingback: Rainbow Fish | Hey Look At That Fish! A remarkable post, Alethea! Thanks for sharing. Wonderful, I’m so glad you found it helpful. Love that something so tricksy came to you. A splendid and ever new visit from the creative deep blue. Gosh Alethea, thanks for sharing ! Last night I asked for healing between my masculine and feminine energies and dreamed I was one of the women in the three of cups. We were dipping our feet in a salt stream (I live near an Island called Salt spring) and just then two green parrot fish jumped up and latched onto both my big toes ! they bit hard enough to draw blood and it was as if energy went up both feet and legs to heal me. How could I forget till now that AA Raphael ‘s color is green and has fish to heal ! Face palm ! What a superb article….. Nice to meet you too and to see that the Hexagram (which became my obsession for many years) has meaning for you.